National Center of relevance, Lumignagno is appreciated for the elegance of the type of climbing it offers and for the extreme quality of the rock. This cliff, now historic, has attracted climbers since the dawn of this sport; in the "Classic" sector, many of today's strongest climbers were seen to pass. 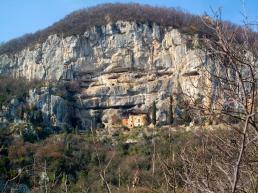 It seems that as early as 1924, by di Severino Casara, the dihedral-fissure of the "Sbrega" rose. Then in the 70s Renato Casarotto and Heinz Mariacher followed. Gear: Mostly good to spit, sometimes old and resinated. Some routes reserve a rather sporty but never dangerous nailing. For the Pistachio, Odor of the Dreams and Technicolor, it is necessary to pay close attention to the departure. The nailing due to the work of Michele Guerrini (still operational), with the exceptional contributions of Martin Scheel, Manolo and many others. Rock: Technical and demanding climbing. A good use of the feet is necessary in particular in the hardest and steepest sectors. Holes are often painful. Biblio: The "Climbing on the Berici Hills" guide is on sale at the "Fantasy" bar. Logistic: Lumignano is a small town but there are still some bars and a supermarket.